"This is a great recipe to serve for breakfast or brunch. 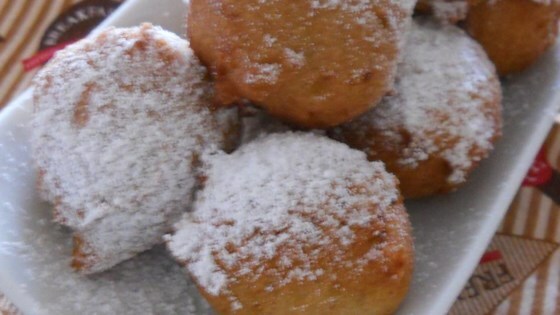 My family always finds it a real treat when I cook these fluffy fritters." In a medium bowl, mix egg, milk and canola oil. Stir into the flour mixture. Mix in bananas and lemon juice. When thoroughly mixed, form mixture into about 10 balls. In batches, fry balls in the prepared oil 5 minutes, or until lightly browned. Drain on paper towels, and sprinkle with confectioners' sugar. When making this you have to put 2 cups flour and 1 cup of milk. not 2 milk and 1 flour. who ever wrote to recipe put it in backwards.